Residents and off-season visitors to the Myrtle Beach area enjoy mild winters with less traffic on the roads, no waiting lines at top restaurants, and reduced prices for local vacation rentals. Discover that Myrtle Beach winter rentals, including luxury winter rentals with southern charm and grace, can be surprisingly affordable along the Grand Strand. Why pay more for your winter heating bill up north than you would enjoying the sunshine and golf at the beach? Head down to the mild temperatures of the South this winter and let Brunswick Plantation show you an affordable option to staying warm, happy, and pampered this winter. With offices in North Myrtle Beach, Elliott Realty has specialized in winter rentals, golf packages, and vacations since 1959, and offers a large selection of winter rentals, including oceanfront, oceanview, and golf course condos available to rent for extended terms and decreased rates during the off-season months. 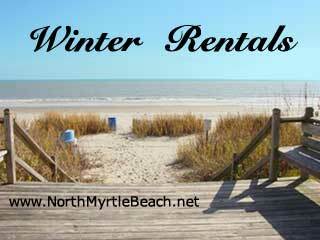 Winter Rentals are generally much more reasonable than during peak season.